For the first time in the U.S., schools in Myrtle Beach, S.C., are adapting hollow-core planks for use as solid state thermal storage during construction of five new schools. This is the first use of the innovative Canadian system in the U.S., and relies upon the planks’ mass to store the thermal energy of the heated or cooled air. Gate Precast’s Oxford, NC, facility is producing 400,000 square feet of adapted hollow-core planks to function as “smart” floors for five schools in Myrtle Beach, S.C., while adapting them to serve as “thermal batteries” to support the facilities’ HVAC system. This is the first use of the innovative Canadian system in the U.S., and relies upon the planks’ mass to store the thermal energy of the heated or cooled air. 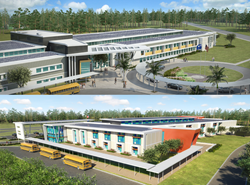 Designed by SFLA Architects of Raleigh, NC, the schools include Carolina Forest Middle School, Myrtle Beach Middle School, St. James Middle School, Sayebrook Middle School and Socastee Elementary School. During the process, Gate is fabricating 10-inch hollow-core planks and utilizing the center three cores (of five) as ducting for the HVAC. The adaptation will allow the schools to use the planks as “thermal batteries,” reducing the typical daily fluctuations in energy consumption. Subsequently, the schools will purchase more of their energy at off-peak times in order to “charge” the planks. Gate was instrumental in providing design-assist as early as 1.5 years prior to project bidding. In preparation for the project’s stringent design criteria and aggressive schedule, Gate installed three new 378-foot-steel form hollow core beds and purchased a new Ultra-Span Hollow-Core Power Plant and 10” Cassette providing the finest quality hollow-core plank finishes in the market while maintaining production levels to service the aggressive construction schedules. Gate is making critical in-plant modifications to the planks to accommodate the innovative system. Gate Precast Company is a subsidiary of Gate Petroleum Company, a privately-held diversified corporation headquartered in Jacksonville, FL. Gate Precast has become one of the largest and most diversified precast concrete producers in the United States, with eight manufacturing facilities, and is known for its design-assist collaboration with design teams. Annually, the company is recognized as a top subcontractor by Engineering News-Record Magazine and wins Best-in-Class PCI Design Awards for a wide range of projects. For more information, please visit http://www.gateprecast.com.